Summer is officially coming to an end, and I'm clinging on for dear life wishing it doesn't go away! I love camping, swimming, festivals, farmers' markets, the list goes on and on. Speaking of lists, I thought I'd share my Top 5 Summer Favorites today. These have been tested and can all withstand the heat, so they are all must haves for summer. Believe it or not, Green Bay DOES have relatively high humidity indexes. To save my hair from getting out of control, I use OGX Kukui Oil's Anti-Frizz Hydrating Oil spray. It claims to "define your curls' curves, eliminate frizz and spritz on a lasting hint of shine." Now, you don't just have to have curly hair to use this product. I wear my hair straight most days and it still works like a dream. The scent is very beachy. To me it smells like a light sugary-coconut. I love the scent that it leaves in my hair. It uses a kukui nut oil blend that is "an ancient Hawaiian secret used for its humidity resistant abilities creating a shimmering gloss to smooth texture and repel humidity..." This oil lives up to every claim. After use, my hair is left soft and shiny and healthy looking. And the days where it's unbearably hot and humid, it never frizzes. My straightened hair is left straight. You can find where to purchase here. Sticking to the topic of heat, my next favorite will help you stay matte, even if you've been sweating all day. NYX's Matte Finish Long Lasting Durable Make-up Setting Spray proved worthy of making it on this list. I wore this to a wedding, where the church was not that well ventilated, and it got warm. This lasted through the tears, pictures, and the heat. I could feel myself starting to sweat, and when finally getting in front of a mirror you would never tell. My makeup stayed in place all day. And this felt amazing using it as a refreshing spray. I also love the size of the bottle, it is small enough to through in a clutch if you bring it along for a night out (which I have done, still works amazing). And the packaging isn't cheap feeling. The plastic cap stays locked on the spritzer so you don't have to worry about any leaking. If you'd like to change your makeup game, click here. If you are in need of a lip-quenching hydrating lip balm, Nivea's Kiss Of Moisture is an item that I highly recommend. After just one use, this made it's way into my list of Holy Grail beauty products. It is amazing! I like slick feeling lip balms instead of the waxy ones, and Kiss of Moisture is not waxy at all. And it's not overly slick as to where it's smearing all over the place and not applying evenly. It's not your 99cent lip balm, but it's definitely not expensive. It doesn't have much of a smell or taste which I don't mind. It's enriched with Shea Butter and Jojoba Oil which i think is where the very faint scent comes from. This product is great with keeping lips moisturized in the sun (though, it doesn't contain SPF), and going in and out of air conditioning. You can pick this up at most registers, or you can click here. 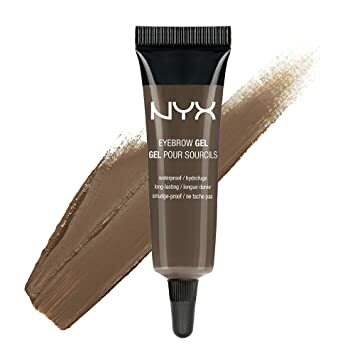 Another NYX item that I favorited over the summer is their Eyebrow Gel. This has been linked as being a dupe for Make Up For Ever's Aqua Brow and Anastasia Beverly Hills' Dipbrow Pomade. Now, I haven't tried either of the high end brow gels, but a quick google search will show you the comparisons. Honestly, this product does take some practice. You can't be heavy handed unless you like the sharpie-brow look. But once you get the hang of it, it can look very natural and I swear this lasts all day. When it gets hot, my brows are the first thing to start melting away. So with all of my summer weddings this year, I wanted a brow product that was going to last. And I am so happy that I picked this up! I wore this to a couple of weddings and out clubbing and it stays put, even if you're wiping your forehead (lol). I picked up the shade Espresso, and it's perfect because while I do have black hairs, unfortunately my brows are sparse. I'm afraid if I used the Black color, my brows would look way too dark. I suggest testing it out, if the color is wrong, most places you'd purchase from do accept returns. You can purchase it here. The last summer favorite I have to share is Maybelline's Lash Sensational Mascara. This instantly looks like you've put on two coats of mascara with just one swipe. The formula is wet, and the brush is unique. You use the inner curve to reach the roots of your lashes and use the longer bristles to fan the lashes out. This mascara is perfectly dramatic, and long lasting. It hasn't flaked off on me yet, and doesn't smear unless you're wearing it for a very extended period of time. This can get a little clumpy if you only use the inner curve to apply product. But the brush has 10 layers of bristles to reach every lash, so be sure to turn it once the initial coat has been applied. To get what everyone has been hashtagging #LashSensational about, click here. Thank you so much for stopping by! I think most of these products will end up being yearly favorites as they could probably be used in all seasons, not just summer. What have you been loving this summer? Let me know in the comments!